Dissolve salt in water. 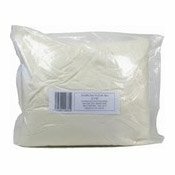 Add 2 cups water to flour and blend. Add remaining water slowly. Knead thoroughly. Separate dough into 2 portions. Form into long sausages about 1 inch diameter. Cut sections every 1 cm. Form sections into balls and use rolling pin to form into round, flat skins about 3 inches diameter. Fill the dumpling skin with different fillings you like, boiling in water or steam. Tips: Harder dough is much easier to fill. 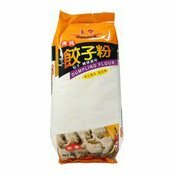 Simply enter your details below and we will send you an e-mail when “Dumpling Flour (康樂餃子粉)” is back in stock!